TO SECURE A RESERVATION A DEPOSIT OF £50 OF THE TOTAL AMOUNT MUST BE PAID VIA PAYPAL OR DIRECTLY TO THE BANK DETAILS PROVIDED. THIS IS A NON-REFUNDABLE PAYMENT SO PLEASE MAKE SURE YOU ARE GOING TO BE STAYING DURING THE TIMES STATED. THE PAYMENT FOR THE PITCH CAN BE MADE IN ADVANCE AT THE SAME TIME AS THE DEPOSIT OR CAN BE MADE ON THE DAY OF ARRIVAL IN CASH. IN ADDITION TO THE £50 DEPOSIT, A £50 DAMAGE AND SECURITY BOND IS ALSO REQUIRED. 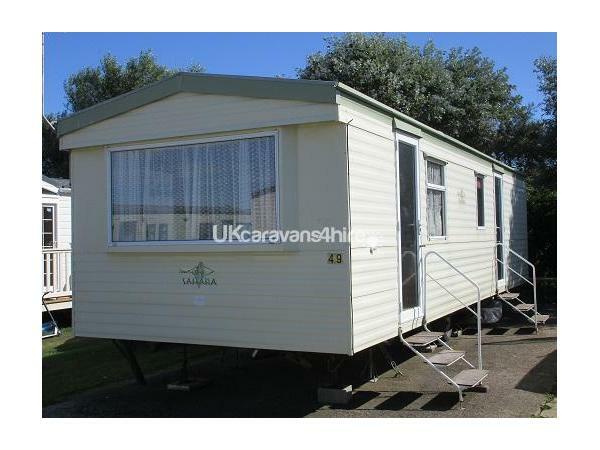 THIS WILL BE RETURNED BACK TO WHERE IT CAME FROM WITHIN 7 DAYS OF VACATING THE CARAVAN ONCE THE CARAVAN HAS BEEN CHECKED FOR DAMAGE, ANY EXCESSIVE MESS OR SOILING OF CARPETS, UPHOLSTERY AND BEDDING OR FAILURE TO WASH AND CLEAN UP UTENSILS AND CUTLERY AFTER USE ETC. ANY SOILING UNREPORTED SUCH AS VOMIT, URINE OR EXCREMENT WILL RESULT IN THE ENTIRE £50 DAMAGE AND SECURITY BOND BEING WITHHELD. 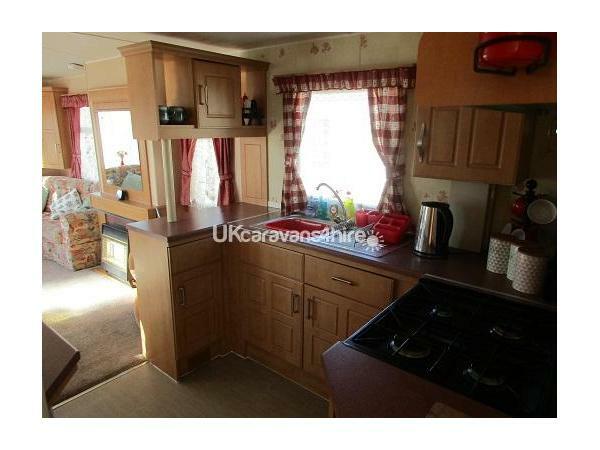 For private rental is a dog friendly, cosy little 6 berth caravan consisting of a seated lounge and eating area, small kitchen, shower and toilet, main double room and bunk bed twin room. 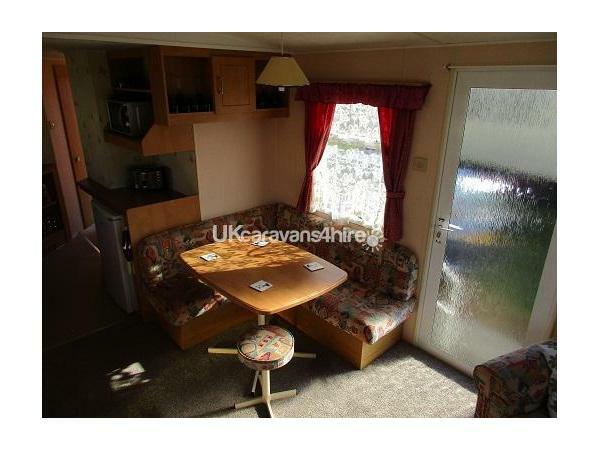 It is ideal for small families or for couples who are looking for something cosy with a little extra space to relax in. The main sofa in the lounge pulls out into a second double bed increasing the sleeping capacity to a maximum of 6 people. This is a private rental so no site passes provided, if you require unlimited use of the site facilities you must purchase those from the main reception. 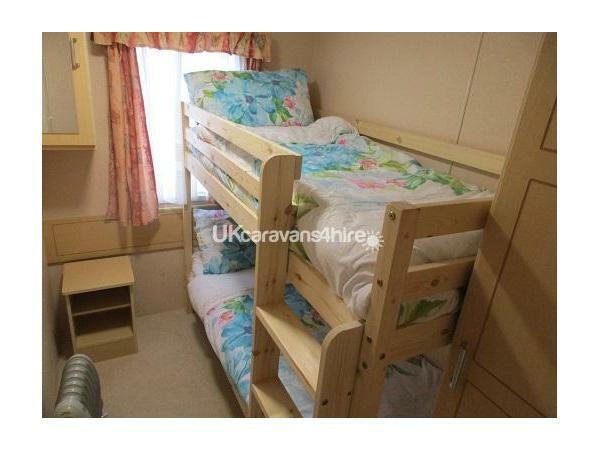 This has a standard 4’6” mattress, wardrobe, little side shelf to the right of the bed as you look at it, overhead storage above the bed and a two shelf cupboard at the foot of the bed. There is a clothes or towel drying frame underneath the bed for use outside if the weather is good. This room has a 2’6” wide bunk bed which is 6’ in length. *IMPORTANT* Please note that the top bunk is strictly for children age 6 years and over in accordance with the manufacturer guidelines. 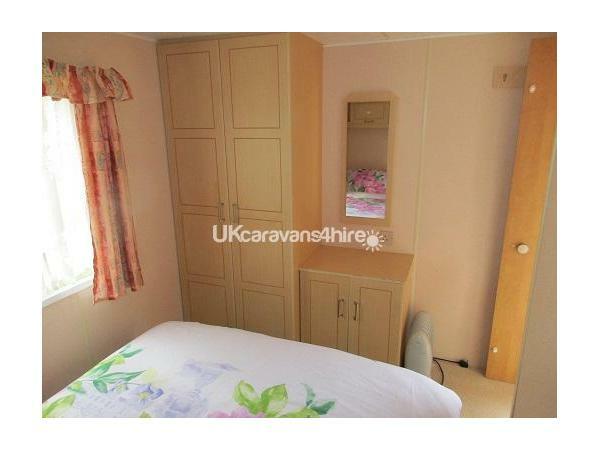 It also has a wardrobe and overhead cupboard space. Located under the bed are outdoor chairs. 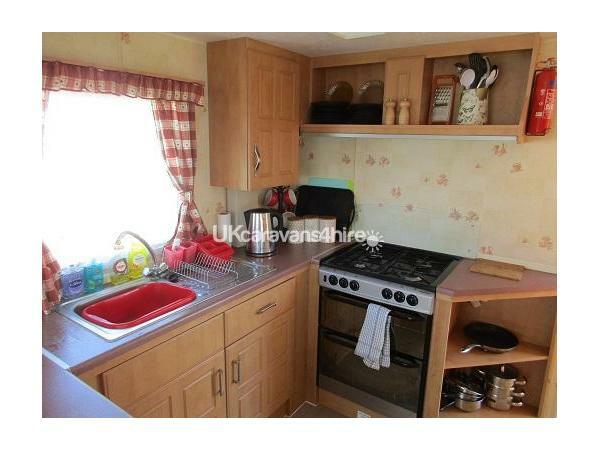 This compact kitchen has got everything you will need during your stay. Hot and cold water, functional sink with washing up liquid and a couple of pan scrubs or cloths, gas cooker, fridge with mini in built freezer at the top, microwave, toaster, kettle, iron, cutlery, utensils, plates, cups, mugs, glasses, pots and pans etc also provided are complimentary coffee, tea and sugar. 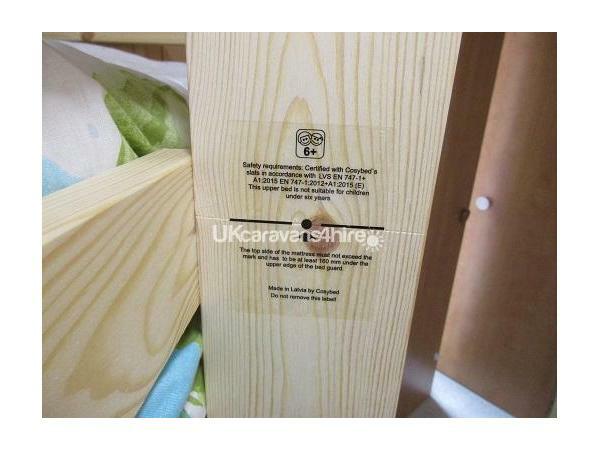 All of the above mentioned items can be found in the range of cupboards and shelves built in. There is also a built in bin for use under the sink. 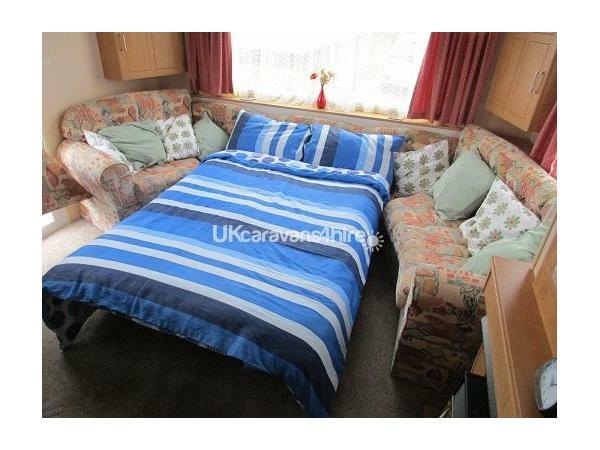 Built in is a large U shape sofa at the far end which has a pull out double bed in the middle section. 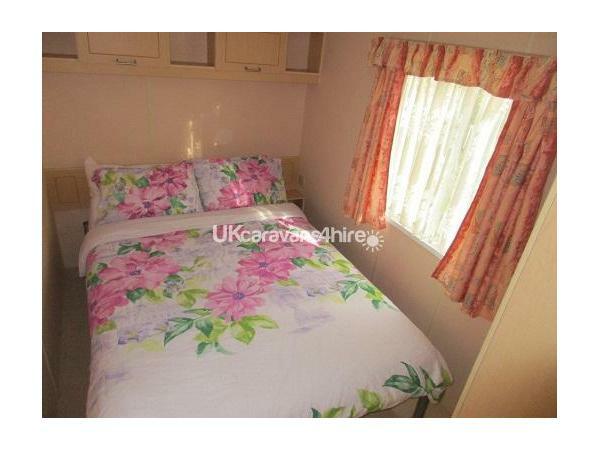 This has a mattress, mattress protector and double fitted sheet folded up inside ready to pull out and use, the double duvet and pillows are found in the main bedroom wardrobe. 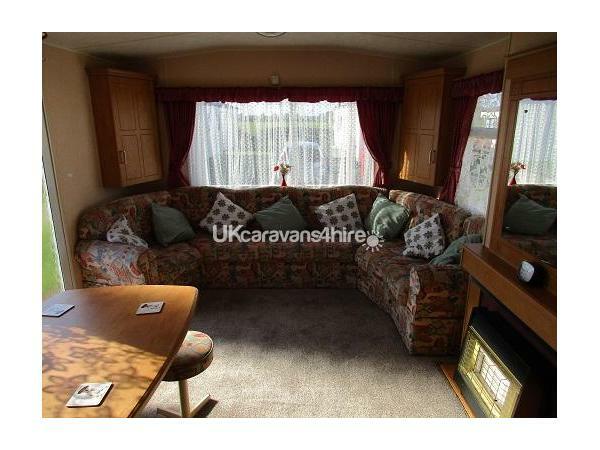 There are two overhead cupboards above the main sofa and scatter cushions dotted around. 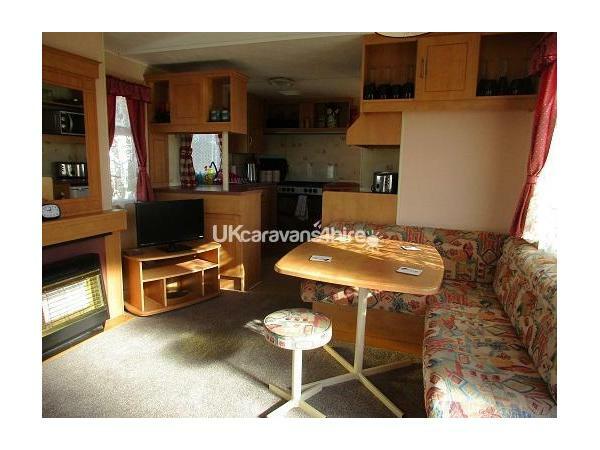 The lounge area also has a small built in L shape seating area, a stool and a dining table as well as a small free view television and built in gas fire. A basic shower unit with a deep tray and plug is built in as is a pedestal sink, mirror, flushing toilet and two overhead shelves for your bathroom products. Liquid hand soap and two loo rolls are provided so if you require more be sure to bring them with you. 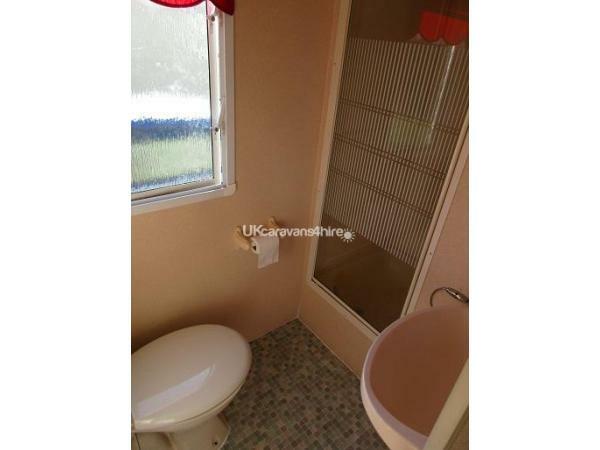 This is located just to the left of the toilet and houses the vacuum, ironing board, parasol for use with the outdoor table and chairs and wind breaker. The longer you stay, the cheaper it will cost per night. 2 or 3 night bookings are only welcome if there is a gap in between bookings in the calendar that needs to be filled...no 1 night stays. To make the reservation you will be sent the private caravan booking form via email or in the post. It must be signed and returned via email or post with the non-refundable £50 deposit and the £50 damage and security bond. The damage and security bond will be returned once the van has been checked after your departure to make sure it has been left as it was found and nothing has been broken or damaged. Full payment for the remaining balance can be paid in advance if you wish or can be paid in cash on the day of arrival.